If you asked me whether it is easy to prepare this traditional steamed glutinous rice cake 20 years ago, I can tell you it is laborious. In fact you need patience to soak the glutinous rice, steam it, pound the Pandanus leaves, squeeze the juice, beat the egg, make the coconut custard and steamed it again..It is quite impossible for me to think that it is possible to prepare this snack within 1.5 hours. 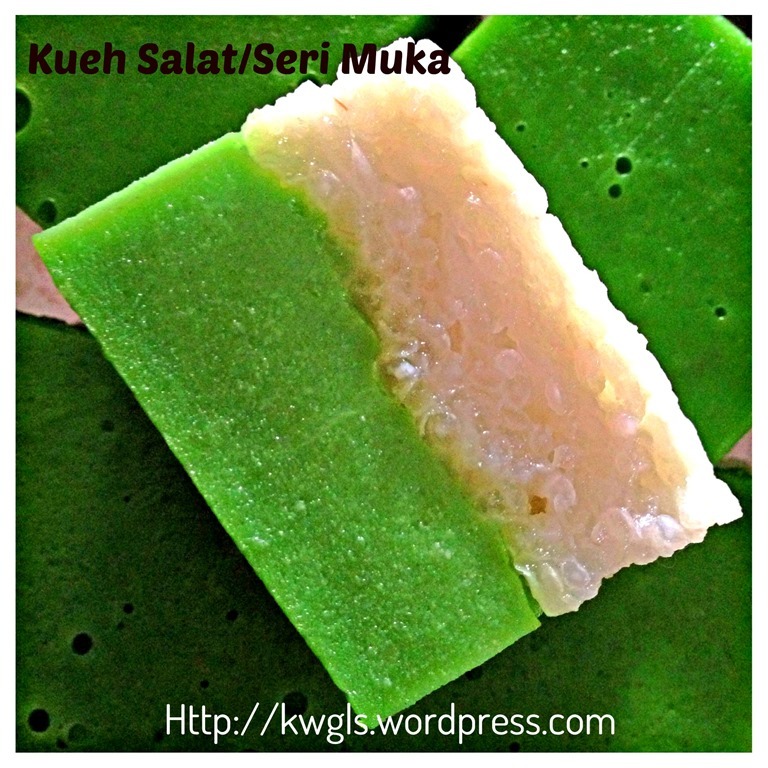 However, yesterday, while I was shopping for my weekly groceries in a shopping centre, I have this sudden urge to eat something sweet and with coconut milk, It just suddenly struck my mind that I wanted to prepare some Kueh Salat or Kueh Seri Muka. When I reached home, with a bit of planning, I get my kueh done within 1.5 hours. Thanks to rice cooker and juice blender.. Yes, I have did the short cut method bypassed the traditional ways of preparing it. With the availability of new kitchen equipment, all this is possible without compromising much the taste.. Though I have prepared it in a rather fast manner, but I have to say that I am pleased with the results of my experiment. 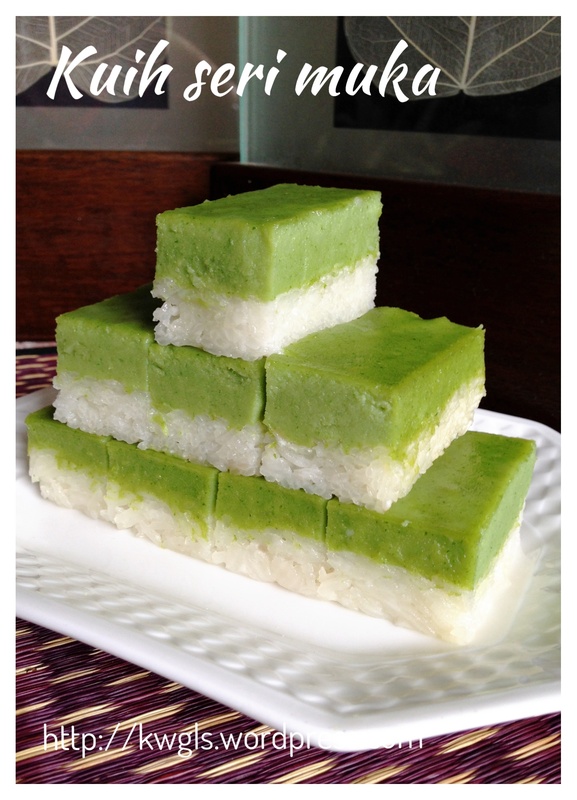 In fact, it is addictive especially the green custard layer. I confessed that I did use some Wilton colouring to get this colour. But that is optional. Without the use of permitted food colouring, the colour shall be a bit dull but equally delicious. I did think of trying to use “spinach” as a colouring agent, however, since I can’t find any spinach in my refrigerator, I have shelved the idea of experimenting this. The texture of glutinous rice is just nice for my liking since I do not like the overly cooked sticky glutinous rice grain, However, if you prefer softer glutinous rice grain, you can either add a bit (additional 1/4 cup) more water to the rice or steamed it for a longer time before the custard layers are poured into the glutinous rice. I intended to use pea flowers to colour the rice into blue colour, but I can only find a handful of miserable pea flowers some of which had already dries up. As a result, the blue shade in the glutinous rice were not obvious. Therefore, if you need a darker blue shade in the glutinous rice, you have to use at least 30-40 flowers for the juice extraction. 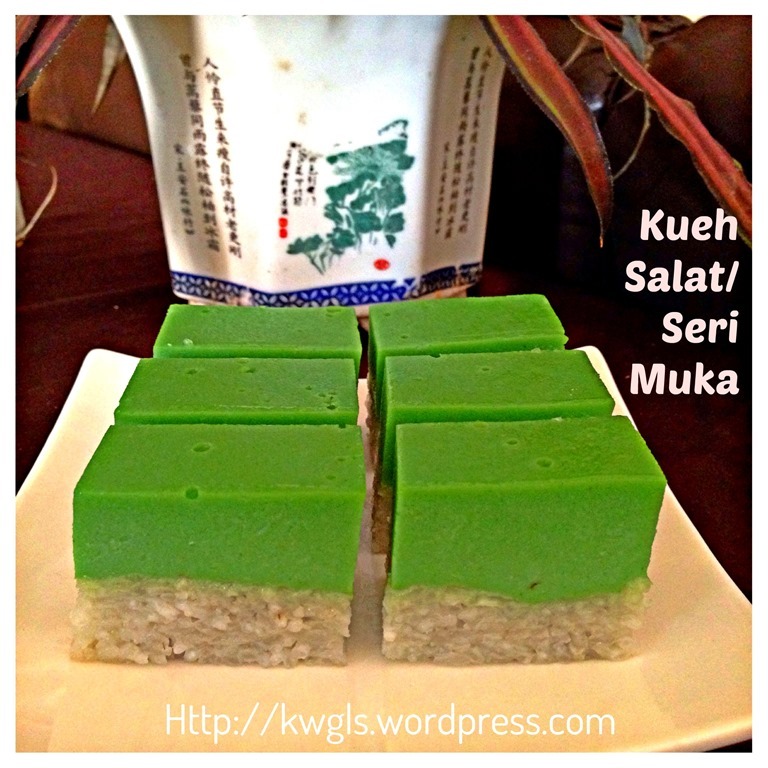 Again, this is optional, the addition is purely for decoration only.. Only Nonya version of Kueh Salat use blue pea flowers whereas the Malay version usually do not use the flowers. at least 10 pieces of pandanus leaves, wash and cut into smaller pieces. Lightly grease an 8” diameter baking tin and ensure that the tin can be placed in your steamer. 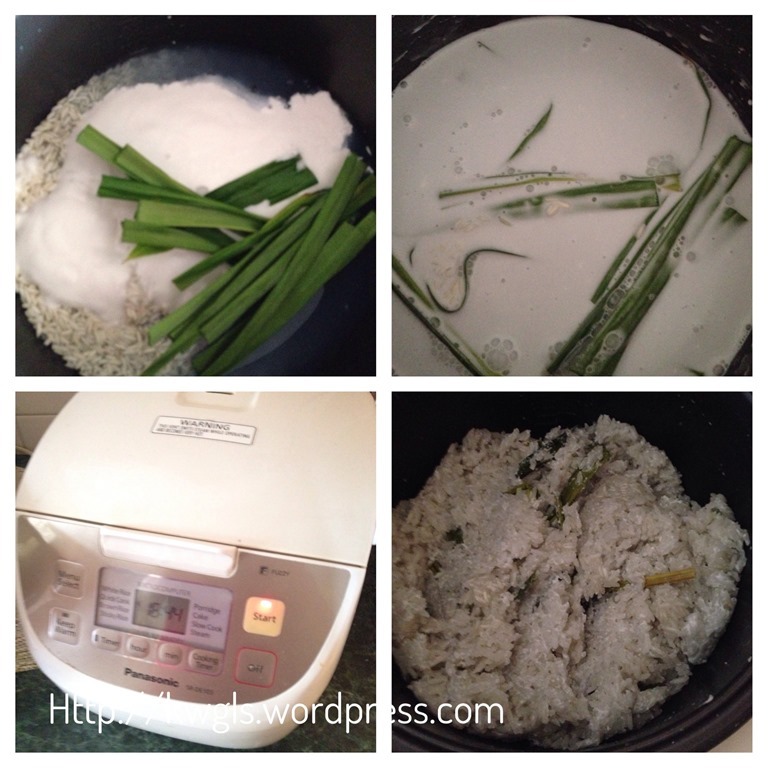 Wash the glutinous rice and put in the rice cooker pot. 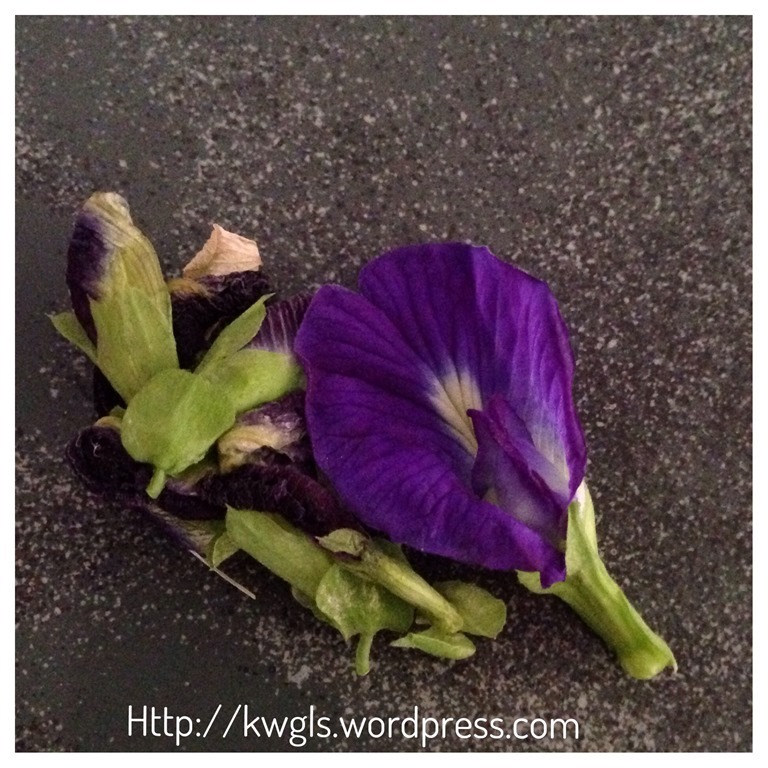 Pound the blue pea flower (bungar terang), and add the 100 ml of fresh water to the pounded blue pea flower. Sift the blue colour water into the rice cooker pot. Add in the 200 ml of thick coconut milk and pinches of salt. Add in the pandanus leaves. 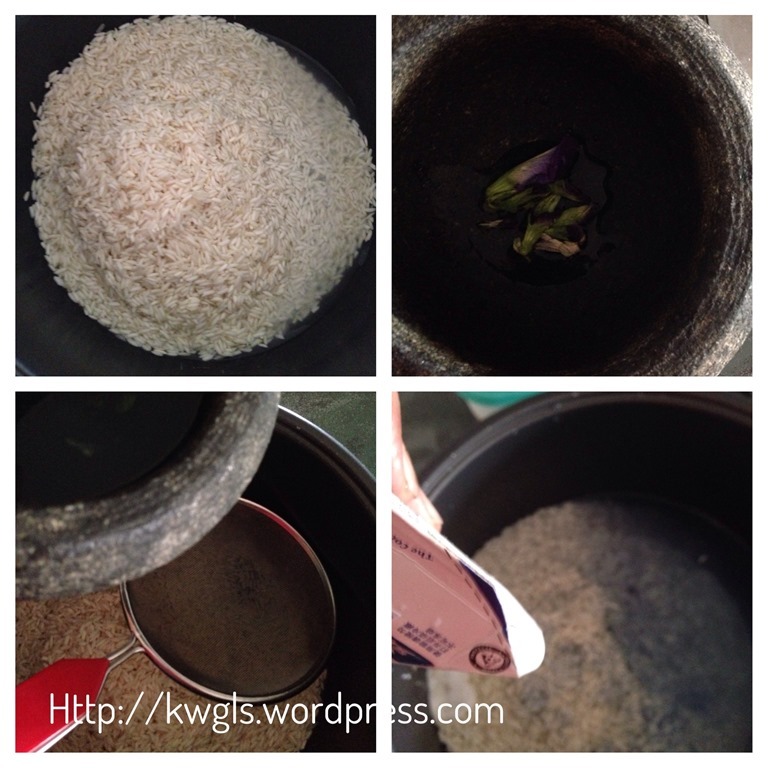 Stir until well mix and cook in the rice cooker using the “sticky rice” or “glutinous” rice function. If your rice cooker do not have this function, just cook it like white rice. However, you may need to cook for another cycle or until the desired texture. If water dries up too quickly, just add additional water. Let it cool and set aside. 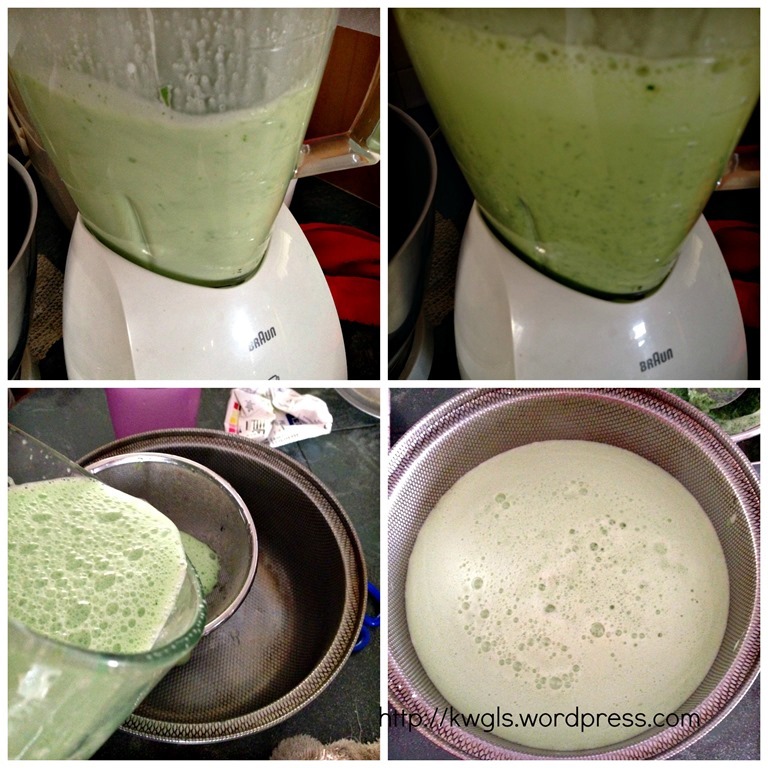 In a blender, add in the cut pandanus leaves. 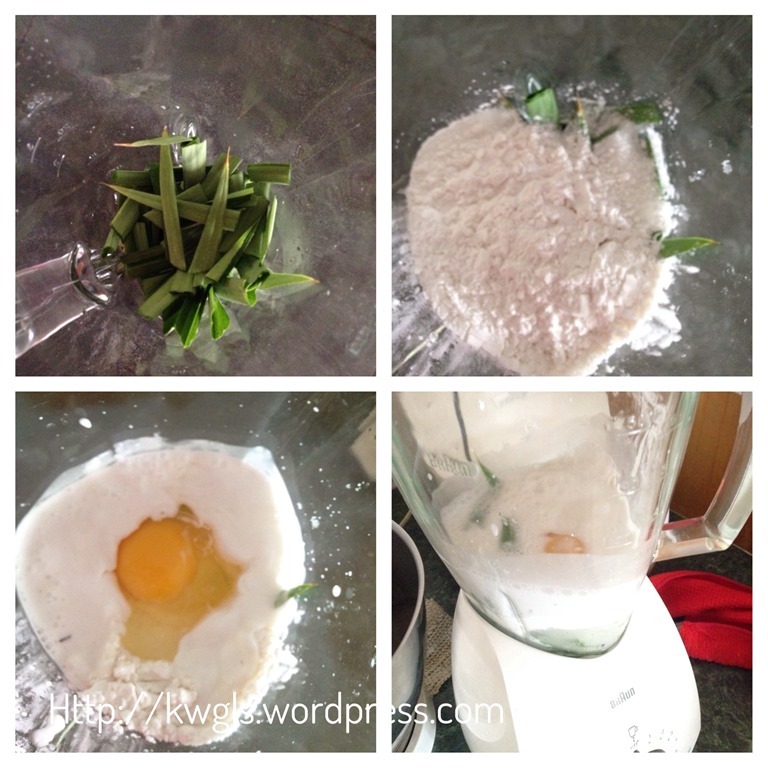 Add in all the ingredients (sago flour, water, sugar, eggs, coconut milk, permitted food colouring and salt) and use a blender to blend until fine. Sift the mixture into a pot suitable for cooking the custard. Set aside and proceed to the next step. Lightly grease a baking tin for steaming. 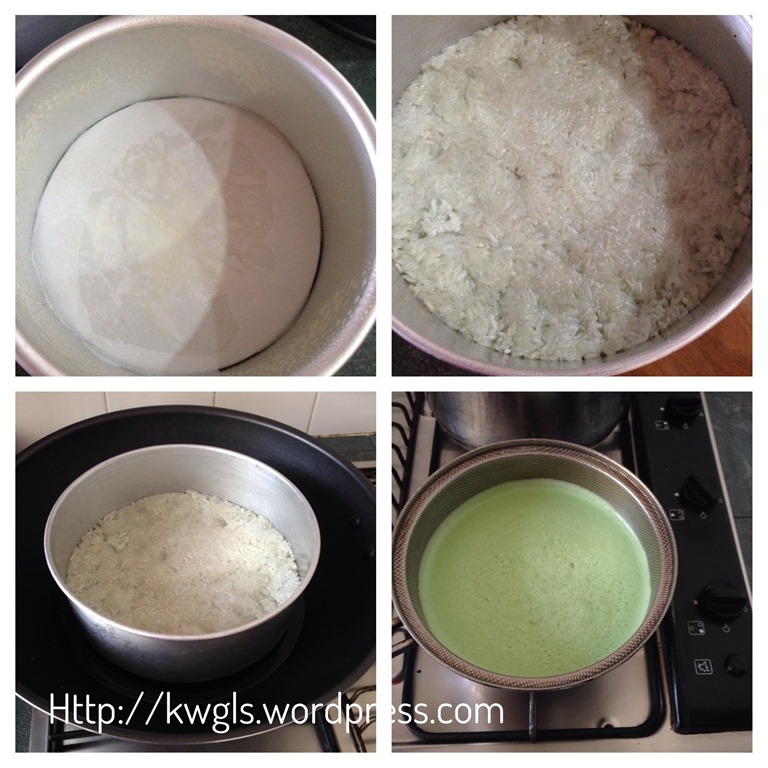 Transfer the cooked glutinous rice into the tin and pressed it hard against the bottom. 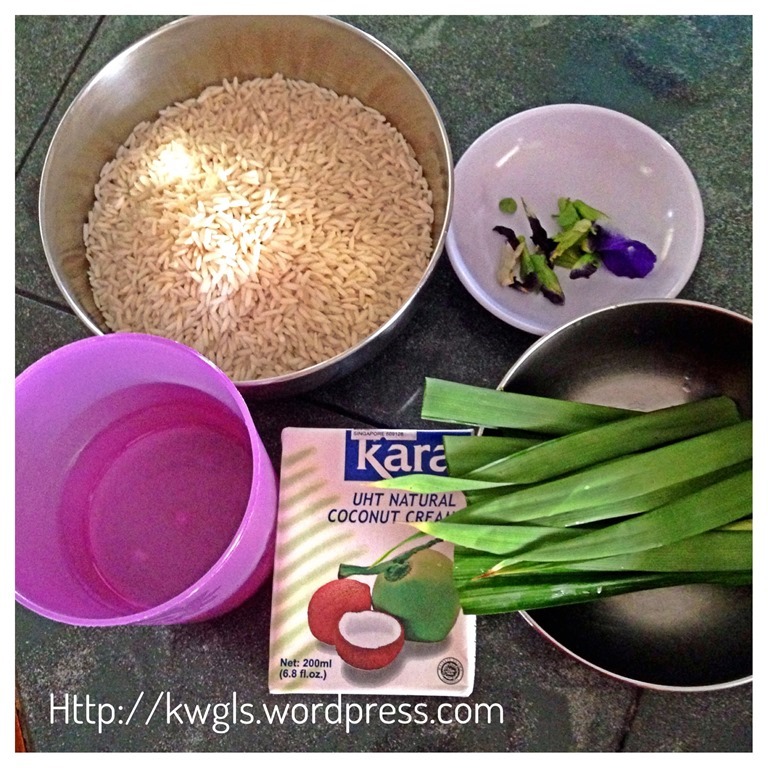 Let the glutinous rice become as compact as possible. Meanwhile, get ready a steamer and put some water for steaming. Place the baking tin in the steamer and start steaming while you are cooking your coconut custard. Actually, pre-steaming is not necessary now since the rice is at least 90% cooked. However, as you want to continue the steaming when your coconut custard is cooked, you might as well start the steaming now. While the glutinous rice is steamed, cook the coconut custard under medium heat (I have bypassed the step of cooking the custard over the hot water as I found that a slight curdling is acceptable since it will be fully cooked in the steaming process). But do not use high heat as the curdling process can be rather fast and uncontrollable. Constantly stir the coconut custard.. When you witness a lot of bubbles and the custard is SLIGHTLY difficult to stir (especially at the bottom of the sauce pot), transfer the half cooked custard to the steaming glutinous rice. Continue steaming under high heat until the custard is set which takes about 15-20 minutes. As an indication, you can see the custard layer starts to pull away from the greased tin if it is set. Use a skewer to insert in the centre of the cake and ensure that the skewer comes out clean. Cooled completely before cutting into smaller pieces using a sharp knife. With the availability of newer kitchen equipment, it is not difficult to prepare at all. 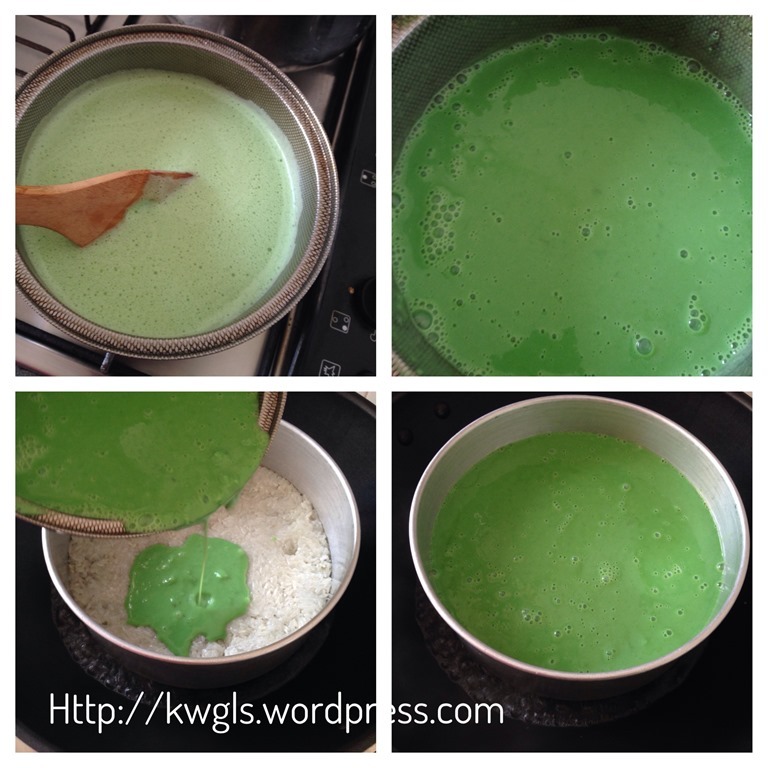 Do try and see if you like this traditional steamed glutinous rice cake. 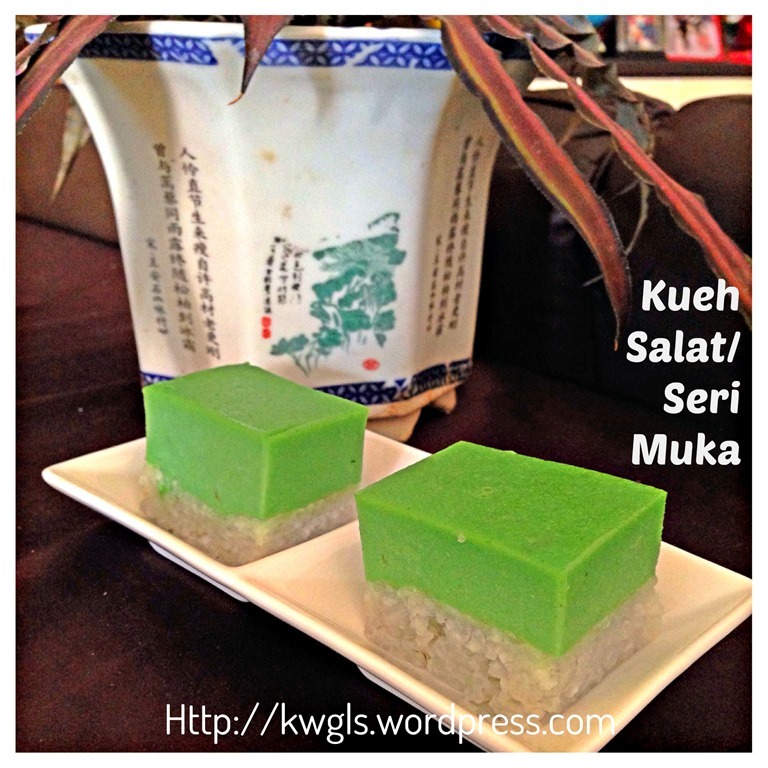 This entry was posted in Chinese and Asian Cakes and Snacks, Food Preparation Series and tagged 8, 香兰椰香蒸糕, GUAI SHU SHU, Guaishushu, kenneth goh, kueh salat, kueh seri muka, nonya kueh salat, postaday. Bookmark the permalink. lovely colour it is very attractive to look at. Sounds VERY involved and looks striking. I think I would love this, I love anything coconut/gelatinous/custardy etc. Am tempted to try… is there an easier version?! So sorry, I think I have cut short at least 50% of the time and work involved as compared to the traditional version. I am sure you will like it as it took me only 1.5 hours to prepare this. I’m keen to try this for a party this year – maybe my birthday or my daughter’s. It looks like it would be a real show stopper. It also actually works with our family’s food intolerances which is a massive plus! Can I omit the eggs which smells really eggy? What can I replace the eggs with? 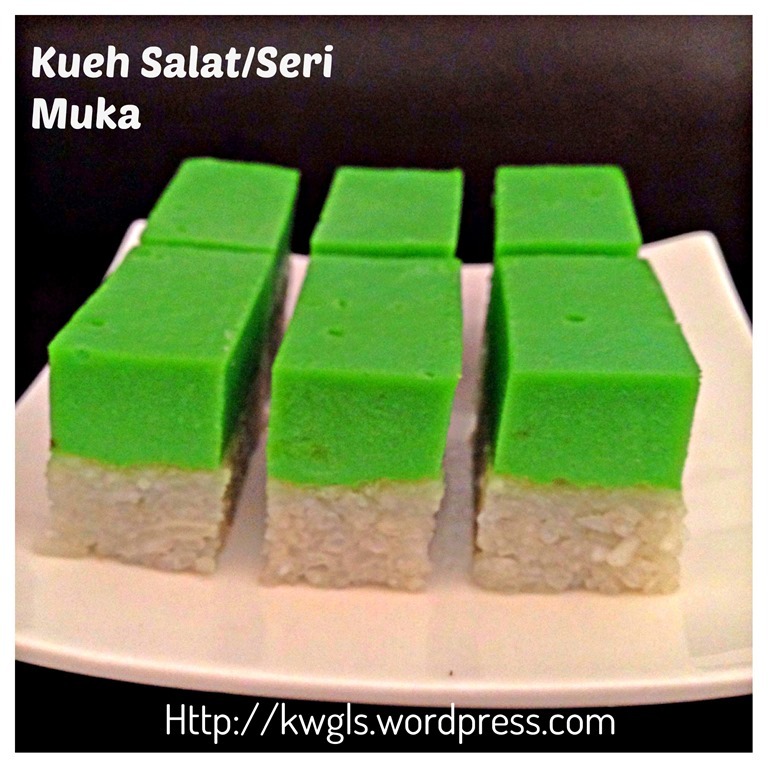 And I would like to know why some recipes of seri muka have eggs and some don’t ?what is the purpose of eggs?? I’m going to try and make this recipe vegan, which means no eggs. I’ve looked up egg replacers and I’m going to use soft tofu in place of the eggs. The site I looked at for egg replacers said to blend tofu in a blender or processor so it would be very smooth for use in a custard. Hopefully this will work. 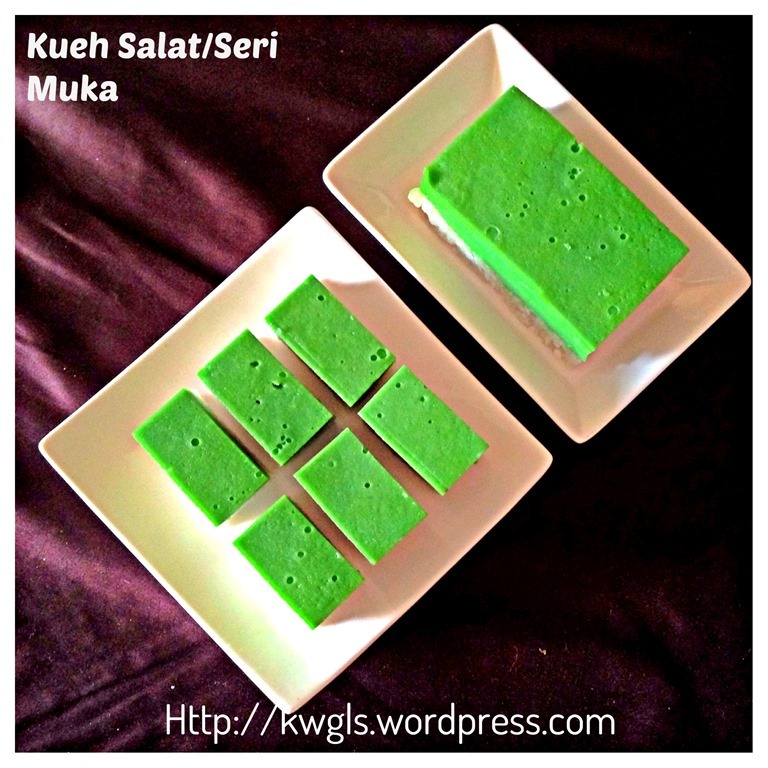 I’m really wanting some seri muka!!! Thank you Kenneth for sharing! 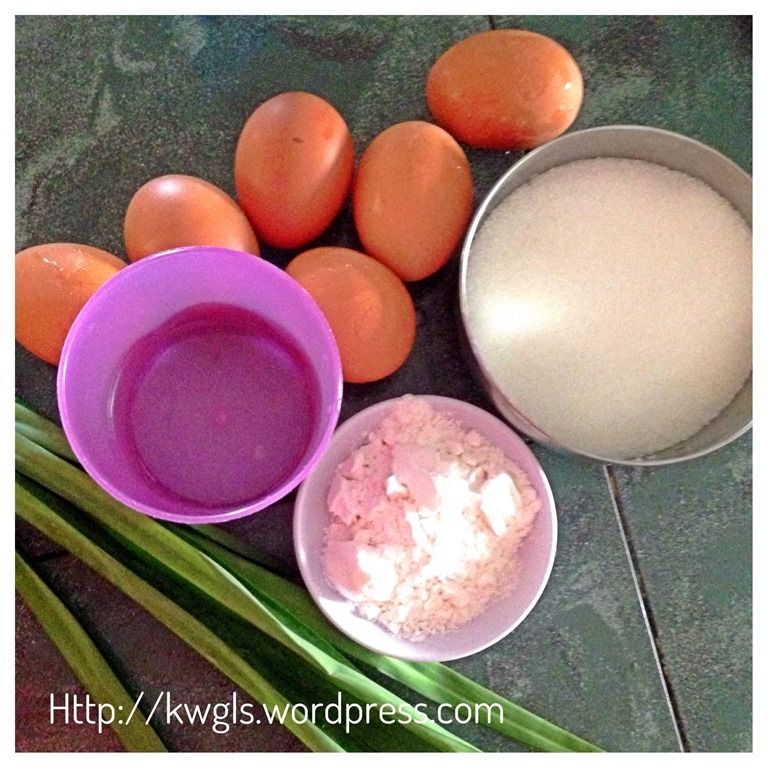 i hope it will work for you too..but the egg fragrance are no more there..
this is my all time fav kueh! The colour turned out very nicely and I’m so motivated to try this Kenneth! You have made cooking seem so easy and achievable it is really motivating for a noob cook like me. May I ask where I can get the Pea Flower from? HOpe it work for you. I started this way and hence I used my experience to share with all in the easiest possible manner. I have done this kueh before but both times, my tops are wavy. I thought I need to steam over low heat like egg custard but your recipe shows high heat and yet yours is smooth and does not have the wavy look. I wonder if it is because your custard is pre cooked. 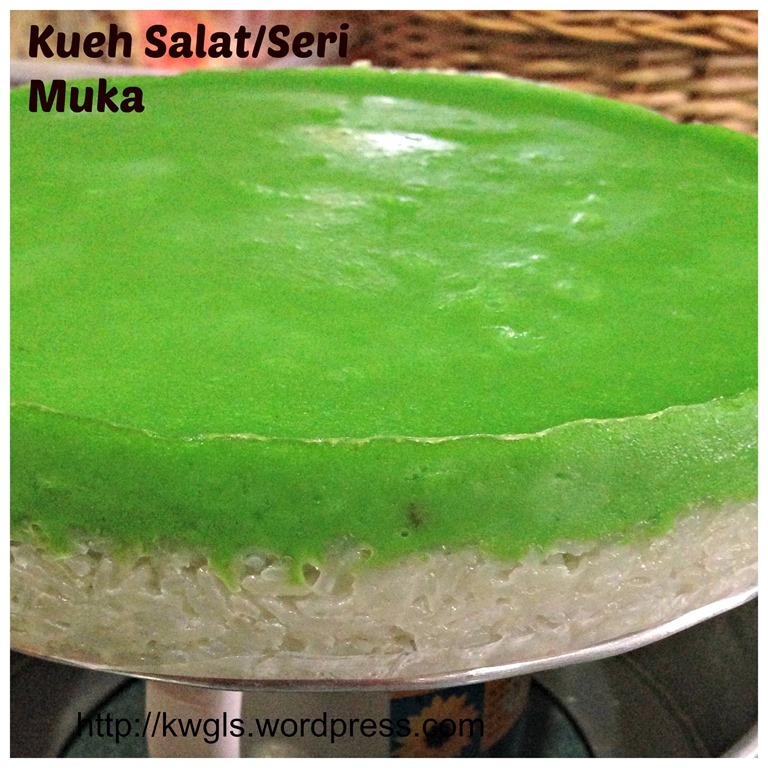 Mine is not cooked first but just poured over the rice layer after mixing. 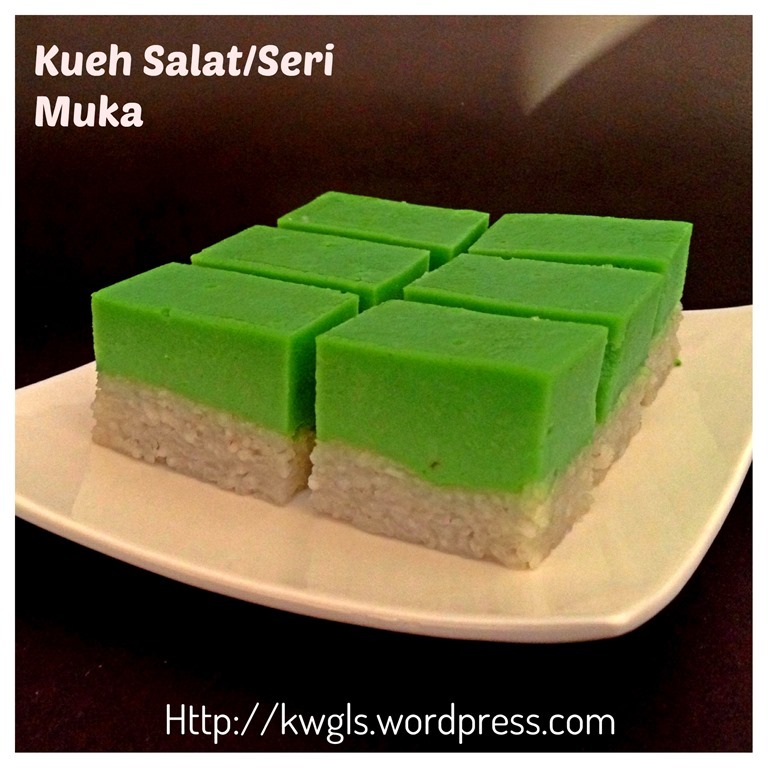 So question here is: does high or low heat during steaming affect the top appearance of the kueh?